As many families do, we have pets. We have a bird, a snake, and a dog and cat. Our pets are very important to our family, and very much a part of it. Our cat and dog are nearly always by me, even as I blog! Fleas and ticks have no place on your pet... but in order to keep your pet safe from them you need to have some help. There is a loving, protective spirit that comes with a close pet relationship. You will do anything to protect your best friend. That means using Vectra 3D – long lasting, broad spectrum parasite control for dogs – flea and tick control. For your small dog or puppy, use Vectra for Dogs and Puppies. Or for your cat, use Vectra for Cats and Kittens. It only takes one bite to potentially spread disease. Enter Vectra’s Protect the love Facebook Sweepstakes for a $100 gift card to use at their next veterinarian visit. A gift card will be rewarded each week for the duration of the Sweepstakes. 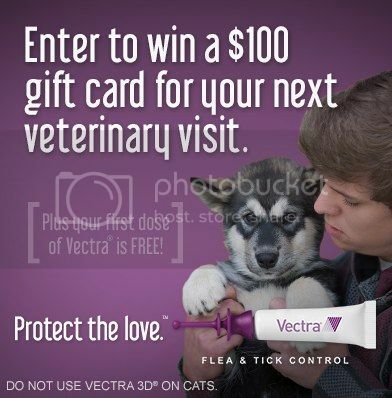 Each entrant to the Protect the love Sweepstakes can also claim a free dose of Vectra flea & tick control. You can print out a coupon for a free dose to redeem at a Vectra veterinarian near you. All you need to do is enter the sweepstakes, then visit FirstDoseFree.com and fill out the form! ***Protect the love™ is the official social identity of Vectra flea & tick control. Vectra is a product of Ceva Animal Health, LLC and has multiple formulas for dogs, cats, puppies and kittens.